This article is about the opera house. For other uses, see Scala (disambiguation). La Scala ( UK: /læˈskɑːlə/ , US: /lɑː-/ ,  Italian: [la ˈskaːla] ; abbreviation in Italian language for the official name Teatro alla Scala [teˈaːtro alla ˈskaːla] ) is an opera house in Milan, Italy. The theatre was inaugurated on 3 August 1778 and was originally known as the Nuovo Regio Ducale Teatro alla Scala (New Royal-Ducal Theatre alla Scala). The premiere performance was Antonio Salieri's Europa riconosciuta . Most of Italy's greatest operatic artists, and many of the finest singers from around the world, have appeared at La Scala. 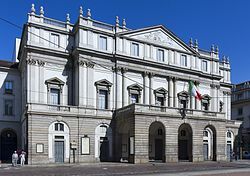 The theatre is regarded as one of the leading opera and ballet theatres in the world and is home to the La Scala Theatre Chorus, La Scala Theatre Ballet and La Scala Theatre Orchestra. The theatre also has an associate school, known as the La Scala Theatre Academy (Italian: Accademia Teatro alla Scala), which offers professional training in music, dance, stage craft and stage management. The La Scala Theatre Ballet is the resident classical ballet company at La Scala in Milan, Italy. One of the oldest and most renowned ballet companies in the world, the company pre-dates the theatre, but was officially founded at the inauguration of La Scala in 1778. Many leading dancers have performed with the company, including Mara Galeazzi, Alessandra Ferri, Viviana Durante, Roberto Bolle and Carla Fracci. The official associate school of the company is the La Scala Theatre Ballet School, a constituent of the La Scala Theatre Academy. La Scala's season opens on 7 December, Saint Ambrose's Day, the feast day of Milan's patron saint. All performances must end before midnight, and long operas start earlier in the evening when necessary. The Museo Teatrale alla Scala is a theatrical museum and library attached to the Teatro alla Scala in Milan, Italy. Although it has a particular focus on the history of opera and of that opera house, its scope extends to Italian theatrical history in general, and includes displays relating, for example, to the commedia dell'arte and to the famous stage actress Eleonora Duse. 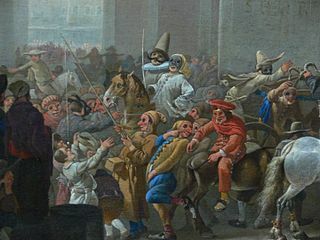 A fire destroyed the previous theatre, the Teatro Regio Ducale, on 25 February 1776, after a carnival gala. A group of ninety wealthy Milanese, who owned private boxes in the theatre, wrote to Archduke Ferdinand of Austria-Este asking for a new theatre and a provisional one to be used while completing the new one. The neoclassical architect Giuseppe Piermarini produced an initial design but it was rejected by Count Firmian (the governor of the then Austrian Lombardy). Carnival is a Western Christian and Greek Orthodox festive season that occurs before the liturgical season of Lent. The main events typically occur during February or early March, during the period historically known as Shrovetide. Carnival typically involves public celebrations, including events such as parades, public street parties and other entertainments, combining some elements of a circus. Elaborate costumes and masks allow people to set aside their everyday individuality and experience a heightened sense of social unity. Participants often indulge in excessive consumption of alcohol, meat, and other foods that will be forgone during upcoming Lent. Traditionally, butter, milk, and other animal products were not consumed "excessively", rather, their stock was fully consumed as to reduce waste. Pancakes, donuts, and other desserts were prepared and eaten for a final time. During Lent, animal products are no longer eaten, and individuals have the ability to give up a certain object or activity of desire. Giuseppe Piermarini was an Italian architect who trained with Luigi Vanvitelli in Rome and designed the Teatro alla Scala in Milan (1776–78), which remains the work by which he is remembered. Indeed, "il Piermarini" serves as an occasional euphemism for the celebrated opera house. Piermarini was appointed professor in the Academy of Fine Arts of Brera, better known as Brera Academy, Milan, when it was formally founded in 1776. A second plan was accepted in 1776 by Empress Maria Theresa. The new theatre was built on the former location of the church of Santa Maria alla Scala, from which the theatre gets its name. The church was deconsecrated and demolished and, over a period of two years, the theatre was completed by Pietro Marliani, Pietro Nosetti and Antonio and Giuseppe Fe. The theatre had a total of "3,000 or so" seats  organized into 678 pit-stalls, arranged in six tiers of boxes above which is the 'loggione' or two galleries. Its stage is one of the largest in Italy (16.15m d x 20.4m w x 26m h). Santa Maria alla Scala was a church built in the gothic style in Milan in 1381 and named in honour of Beatrice Regina della Scala, the wife of Bernabò Visconti who commissioned the building. The church was demolished in 1776 to make way for the ducal theatre which became the Teatro alla Scala. Building expenses were covered by the sale of boxes, which were lavishly decorated by their owners, impressing observers such as Stendhal. La Scala (as it came to be known) soon became the preeminent meeting place for noble and wealthy Milanese people. In the tradition of the times, the main floor had no chairs and spectators watched the shows standing up. The orchestra was in full sight, as the orchestra pit had not yet been built. Above the boxes, La Scala has a gallery—called the loggione—where the less wealthy can watch the performances. The gallery is typically crowded with the most critical opera aficionados, known as the loggionisti, who can be ecstatic or merciless towards singers' perceived successes or failures. For their failures, artists receive a "baptism of fire" from these aficionados, and fiascos are long remembered. For example, in 2006, tenor Roberto Alagna was booed off the stage during a performance of Aida . This forced his understudy, Antonello Palombi, to quickly replace him mid-scene without time to change into a costume. La Scala was originally illuminated with 84 oil lamps mounted on the stage and another thousand in the rest of theatre. To prevent the risks of fire, several rooms were filled with hundreds of water buckets. In time, oil lamps were replaced by gas lamps, these in turn were replaced by electric lights in 1883. The original structure was renovated in 1907, when it was given its current layout with 1,987 seats. In 1943, during World War II, La Scala was severely damaged by bombing. It was rebuilt and reopened on 11 May 1946, with a memorable concert conducted by Arturo Toscanini—twice La Scala's principal conductor and an associate of the composers Giuseppe Verdi and Giacomo Puccini—with a soprano solo by Renata Tebaldi, which created a sensation. La Scala hosted the first productions of many famous operas, and had a special relationship with Verdi. For several years, however, Verdi did not allow his work to be played here, as some of his music had been modified (he said "corrupted") by the orchestra. This dispute originated in a disagreement over the production of his Giovanna d'Arco in 1845; however the composer later conducted his Requiem there on 25 May 1874 and he announced in 1886 that La Scala would host the premiere of what was to become his penultimate opera, Otello . The premiere of his last opera, Falstaff was also given in the theatre. In 1982, the Filarmonica della Scala was established, drawing its members from the larger pool of musicians that comprise the Orchestra della Scala. The theatre underwent a major renovation from early 2002 to late 2004. The theatre closed following the traditional 7 December 2001 season opening performances of Otello, which ran through December. From 19 January 2002 to November 2004, the opera company transferred to the new Teatro degli Arcimboldi, built in the Pirelli-Bicocca industrial area 4.5 miles (7.2 km) from the city centre. The renovation by architect Mario Botta proved controversial, as preservationists feared that historic details would be lost. However, the opera company was satisfied with the improvements to the structure and the sound quality, which was enhanced when the heavy red carpets in the hall were removed. The stage was entirely rebuilt, and an enlarged backstage allows more sets to be stored, permitting more productions. Seats now include monitors for the electronic libretto system provided by Radio Marconi, an Italian company, allowing audiences to follow opera libretti in English and Italian in addition to the original language. Carlo Fontana, the general manager of La Scala since 1990, was dismissed in February 2005 by the board of governors over differences with the music director, Riccardo Muti. The resulting staff backlash caused serious disruptions and staff strikes. In a statement, the theatre's board said it was "urgent to unify the theatre's management." On 16 March 2005, the La Scala orchestra and other staff overwhelmingly approved a no-confidence motion against Muti, and demanded the resignation of Fontana's replacement, Mauro Meli. Muti had already been forced to cancel a concert a few days earlier because of the disagreements. Italy's culture minister, Giuliano Urbani, supported the conductor but called for urgent action by management to safeguard the smooth operation and prestige of La Scala. On 2 April 2005, Muti resigned from La Scala, citing "hostility" from staff members. Pier Luigi Pizzi is an Italian opera director, set and costume designer. Lorenzo Molajoli was an Italian opera conductor who was active in recording during the 1920s and 1930s. Giacomo Rimini was an Italian-born, naturalized-American operatic baritone. He was most admired for his interpretations of the works of Giuseppe Verdi. Romilda Pantaleoni was an Italian soprano who had a prolific opera career in Italy during the 1870s and 1880s. She sang a wide repertoire that encompassed bel canto roles, Italian and French grand opera, verismo operas, and the German operas of Richard Wagner. She became particularly associated with the roles of Margherita in Boito's Mefistofele and the title role in Ponchielli's La Gioconda; two roles which she performed in opera houses throughout Italy. She is best remembered today for originating the roles of Desdemona in Giuseppe Verdi's Otello (1887) and Tigrana in Giacomo Puccini's Edgar (1889). Universally admired for her acting skills as well as her singing abilities, Pantaleoni was compared by several critics to the great Italian stage actress Eleonora Duse. Bernadette Manca di Nissa is an Italian operatic contralto who has sung leading roles in the principal opera houses of Italy as well as internationally. She has appeared at La Scala in Milan, La Fenice in Venice, Teatro San Carlo in Naples, and the Maggio Musicale Fiorentino in Florence as well as at the Royal Opera House, Covent Garden and Gran Teatre del Liceu in Barcelona. Saimir Pirgu is an Albanian international opera singer (tenor). In 2014 he was awarded the Italian citizenship by the President of the Italian Republic Giorgio Napolitano. Alfredo Nigro is an Italian tenor. Ildar Amirovich Abdrazakov is a Russian bass opera singer. Dorina Frati is an Italian classical mandolin player. She performs regularly with European orchestras such as The Philharmonic of La Scala, the National Academy of Santa Cecilia, the National Orchestra of RAI, the Chamber Orchestra of Mantua and the Philharmonic of Rome. She completed her studies with Giuseppe Anedda, graduating from the Pollini Conservatory of Padua, Italy. Ambrogio Maestri is an Italian operatic baritone. He is especially known for his portrayal of the title character in Giuseppe Verdi's Falstaff. He studied piano and singing in his home town, Pavia. In Italy he has performed at the Teatro alla Scala in Milan, Teatro di San Carlo in Naples, Teatro Regio in Parma, Teatro dell'Opera di Roma, Teatro Regio in Turin, Teatro Verdi in Trieste and the Arena di Verona. Abroad he has performed at the Deutsche Oper Berlin, Teatro Nacional de São Carlos in Lisbon, the Royal Opera House in London, the Teatro Real in Madrid, the Metropolitan Opera in New York City, San Francisco Opera House, the Konzerthaus and the Staatsoper in Vienna, the Gran Teatre del Liceu in Barcelona and others. Gloria Banditelli is an Italian mezzo-soprano. She debuted in La Cenerentola in Spoleto in 1979. She is well known both for late-classical early-bel canto era roles of Rossini, Cimarosa and Paisiello, and also baroque opera, such as Monteverdi and Cavalli. NeldaGarrone was an Italian mezzo-soprano, best known for her interpretations of comprimaria roles in some of the earliest complete opera recordings. ↑ "La Scala" (US) and "La Scala". Oxford Dictionaries . Oxford University Press . Retrieved January 20, 2019. ↑ "La Scala revamp finished early". CBC News . 5 November 2004. 1 2 "La Scala board fires top official". BBC News . 25 February 2005. ↑ "Barenboim to head La Scala". Gramophone . London. 14 October 2011. Retrieved 15 October 2011. ↑ It's official: Riccardo Chailly to be La Scala's new music director, Gramophone (London). 10 December 2013. ↑ "Alexander Pereira to Begin La Scala Tenure in October 2014, Year Earlier Than Originally Announced". Opera News . 19 July 2013. Retrieved 7 October 2013. ↑ Cantelli died in an airplane crash one week after his appointment. Beauvert, Thierry; Moatti, Jacques & Kleinefenn, Florian (1995). Opera Houses of the World. New York: The Vendome Press. ISBN 978-0865659773. (Subscription required (help)). Conati, Marcello; Medici, Mario; Trans. William Weaver, eds. (25 July 1994). The Verdi-Boito Correspondence. Chicago: University of Chicago Press. ISBN 978-0226853048. Kelly, Thomas Forrest (10 September 2004). First Nights at the Opera. Yale University Press. ISBN 978-0300100440. Mallach, Alan (30 November 2007). The Autumn of Italian Opera: From Verismo to Modernism, 1890–1915. Lebanon, NH: University Press of New England. ISBN 978-1555536831. Shelley, Mary (1844). Rambles in Germany and Italy in 1840, 1842, and 1843. I. London: Edward Moxon. p. 111. Wikimedia Commons has media related to Teatro alla Scala .